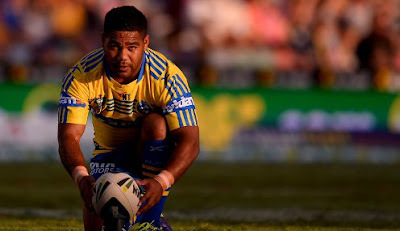 Parramatta Eels have rejected halfback Chris Sandow's request for an immediate release to join Super League side Warrington. Sandow is likely to join the Wolves for next season, but Eels coach Brad Arthur says he won't be allowed to leave until the end of the NRL campaign. The 26-year-old had wanted to leave so he could sign for Warrington ahead of the Super League transfer cut-off on 25th July. But Parramatta would reportedly have then been liable to pay out some of the playmaker's four-year contract and Arthur said he didn't want to lose the player while they are chasing a finals spot. The Eels are 12th, but just one win outside the finals spots and are 5.00 to finish in the top eight, with Manly Sea Eagles 4.50 and Newcastle Knights 21.00. "It's hard to release any player at this time of the year," said Arthur. "I have to do what's best for this team and this club and that's keeping our squad intact and moving forward, we can't be affording to pay players to play at other clubs." The Eels coach doesn't expect his decision will affect Sandow's form in Friday's clash against the eighth-placed Bulldogs at ANZ Stadium. "His attitude is good. He trains well and he's been playing well, he's a competitor and I'm sure that he doesn't want to let his team-mates down and I'm sure he'll have that attitude tomorrow night," said Arthur. Sandow joined Parramatta in 2011 after starting his NRL career with South Sydney, where he won the Dally M rookie of the year award in 2008 and was the inaugural winner of the George Green Medal for indigenous rising star. Warrington coach Tony Smith, who has signed Newcastle Knights veteran Kurt Gidley for next season, has been chasing Sandow since seeing Richie Myler sign for Catalans Dragons.